Captain Electric is a successful, family owned, growing maintenance electrical company based in Ringwood East. 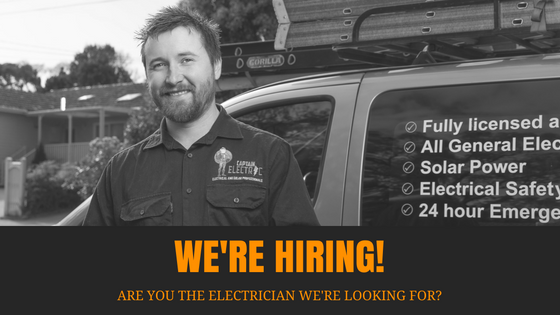 At Captain Electric we pride ourselves on exceptional customer service and communication and we are seeking enthusiastic tradesmen to join our friendly team. You are seeking a guaranteed wage, superannuation, paid overtime and holidays. We are looking for someone that values a long term career with a well-organised, established business with an exciting future. Preferably living local to the Eastern suburbs (due to geographical nature of most of our work). We provide a company vehicle, uniform, mobile phone and/or tablet and on-going training to develop your skills and knowledge. If you know you have what it takes to become a valued member of the Captain Electric team and are up for a new challenge, we would love to hear from you. Please send your CV through asap or apply here.